After producing our Origami Architecture, the Mathematics Society organised an internal competition. This competition is held to promote the skill of making and designing Origami Architecture as well as to highlight the abilities of the school's students and to instill confidence for other national level competition. The judges had a hard time deciding the winner amongst the numerous Origami Architecture artwork on display. Our display was put in the main hall for our school and was decorated by the committee members of the Mathematics Society. Ms. Teh Phei Choo giving us our final comments and advice before the start of the competition. 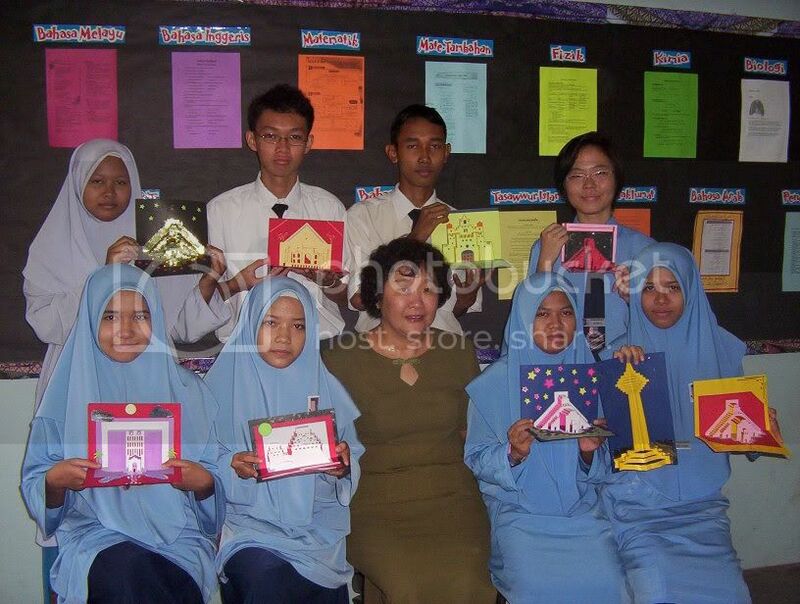 Ms. Teh or more affectionally called as Puan Teh by all students in her class and mathematics society, sparked off this project when she saw some Origami Architecture creations online. Puan Teh guided all of us to achieve our dreams in winning this competition and have taught us many other skills like social skills and manipulation skills. Another photo of Puan Teh giving her guidance to our Origami Architecture team. Being the teacher-in-charge and founder of the Mathematics Society, Puan Teh have given the society vision and guidance as well as completed numerous outstanding projects with our seniors (not featured in this site). Being able to connect with her students, we feel very comfortable working together with Puan Teh. The producer of the Meiji Castle posing with her creation. 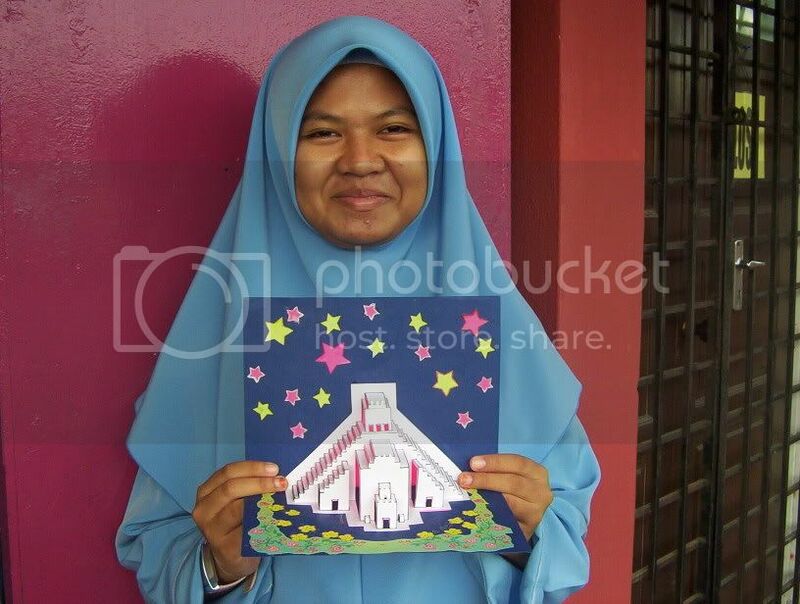 She won the overall first prize for her Origami Architecture. After observing other designs obtained over the Internet, Siti Alnurhafawati Bt. Ahmad managed to grasp the technique behind the creations of Origami Architecture and have made us proud by improvising a fine piece, the Meiji Castle. This is our winning Origami Architecture design team. These are the core people involved in designing the Origami Architecture as well as the core team in the production of various other Origami. The other supporting efforts are made by the other members of the Mathematics Society, making the Origami Architecture success story the Mathematics Society effort. 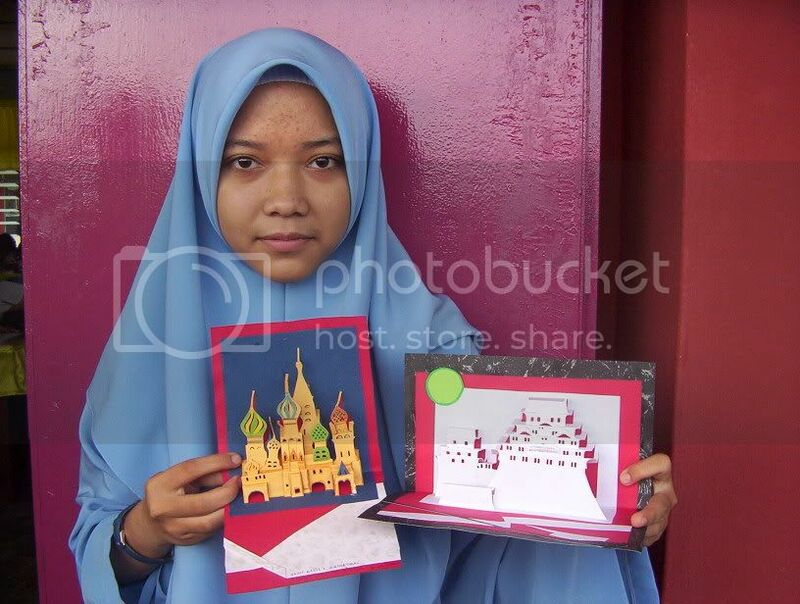 From left to right, are our top Origami Architects, Nur Atiqah bt. 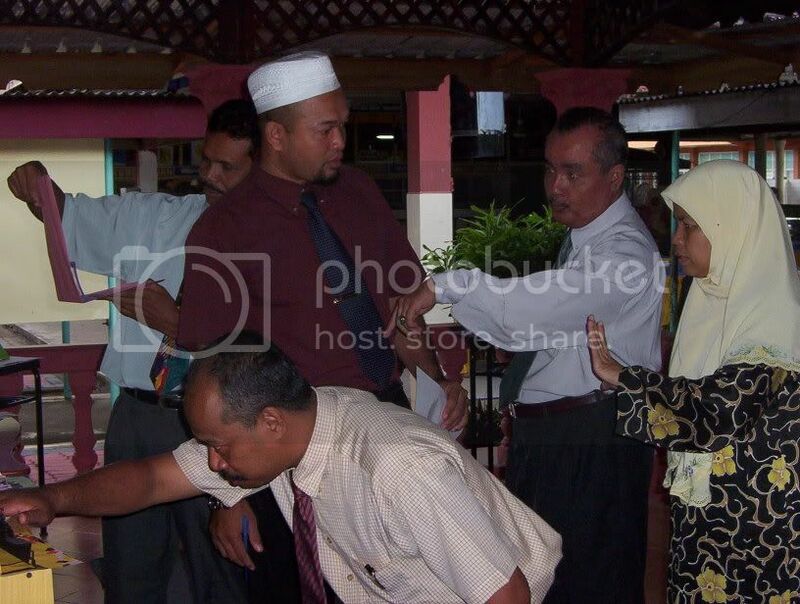 Kamarul Zaman, Nor Wardah and Siti Hajar. 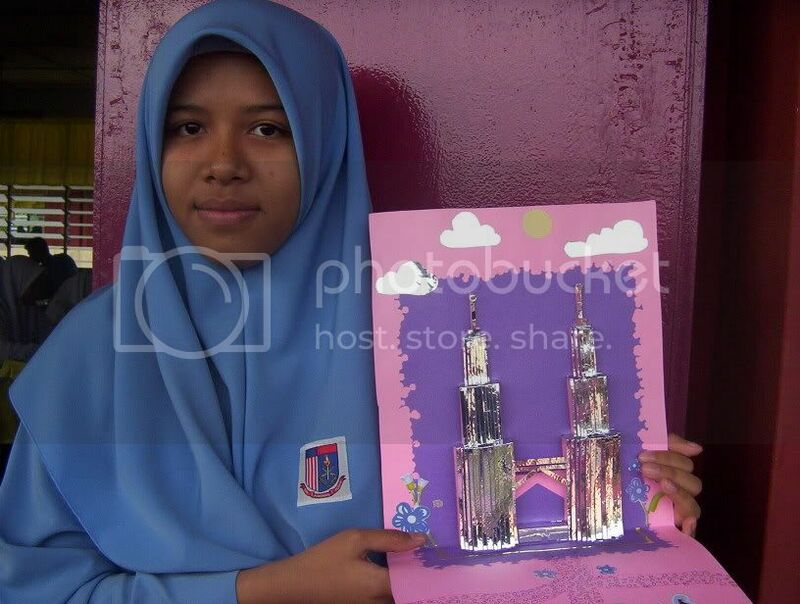 Nur Atiqah produced an original design of the KLCC Twin Towers which won her the best design Origami Architecture in the competition. 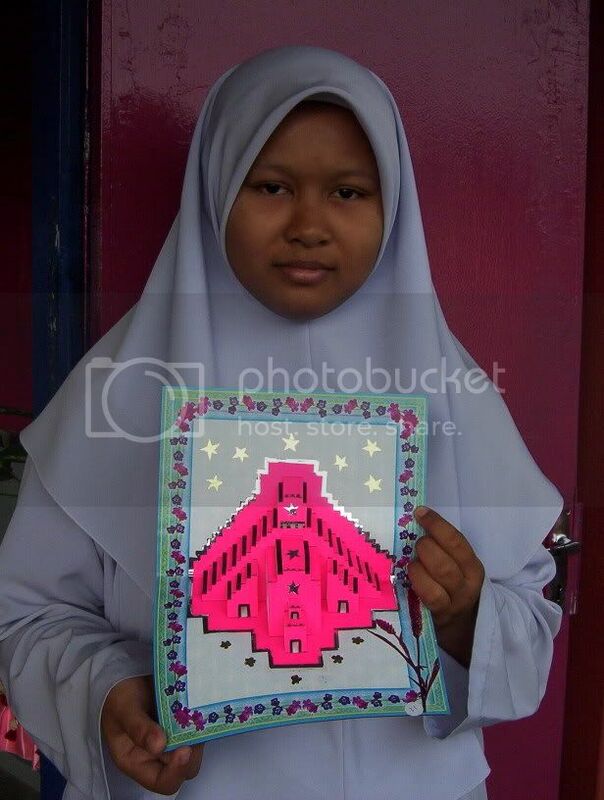 Both Nor Wardah and Siti Hajar are posing with Chichen Itza, their artwork.